The AMX-56 Leclerc was designed to replace the ageing AMX-30 after importation of foreign equipment, such as the American M1 Abrams or the Israeli Merkava main battle tanks, was abandoned. A cooperation between France and Germany was studied but rejected, Germany went on to produce the Leopard 2 and France concentrated on its national project. France found a partner in the United Arab Emirates for the further development of the new tank, thus limiting the unit cost. The Leclerc was designed to be as light as possible while ensuring a highly mobile vehicle. Stress was put on active protection, rather than passive protection as well as mobility for evading incoming fire and firing control systems. 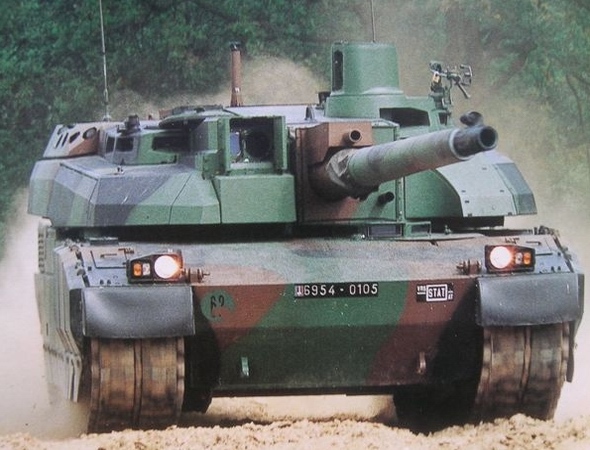 Mass production started in 1990, and Leclerc entered service in 1992, too late to see action in the Gulf War. To this day the Leclerc has not been used in all-out war, although the tank did participate in peace-keeping missions in Kosovo and Lebanon. The Leclerc is fitted with the Galix combat vehicle protection system that includes nine launch tubes for 80mm grenades, smoke grenades, infrared screening rounds and anti-personnel grenades. With a firing rate of 12 rounds/minute, the GIAT CN120-26 120mm smoothbore cannon is designed to fire the standard NATO 120 mm rounds used by the German Leopard 2 and the American M1 Abrams. One of the main features of the AMX-56 Leclerc is the unique autoloading system which was specifically designed for it, and reduces the crew to three by eliminating the human loader. The turret of the Leclerc was designed around the autoloading system in order to avoid the problems common to other tanks with an autoloader. The Leclerc is fitted with the FINDERS (Fast Information, Navigation, Decision and Reporting System) battlefield management system, developed by Nexter Systems. FINDERS includes a colour map display which shows the positions of the host tank, allied and hostile forces and designated targets and can be used for route and mission planning. The Leclerc is powered by a SACM V8X-1500 Hyperbar diesel engine providing 1,500hp that enables the Leclerc to reach speeds of up to 70 km/h.